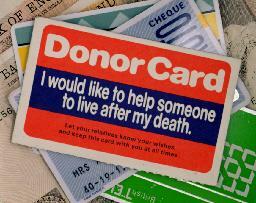 So I’ve just renewed my drivers license and got given a short notification on how to become an organ donor. If you’re in South Africa go to http://www.odf.org.za/ and register…it takes 1 minute and you could help save somebody’s life. It is unthinkable that people are dying left right and center because they don’t have hearts/lungs/kidneys or are living half-lives [blind people needing corneas] when there are people who are perishing with their brilliant organs going squarely into the trash can…seriously this is so ridiculous…If you’re in another country find your organ donor website and register…tell your family…change your Facebook/Twitter status…let’s stop being apathetic about this. For the thinking person, there are no reasonable objections…if it was your mother/brother/friend needing a kidney you couldn’t provide would you be so blasé ?